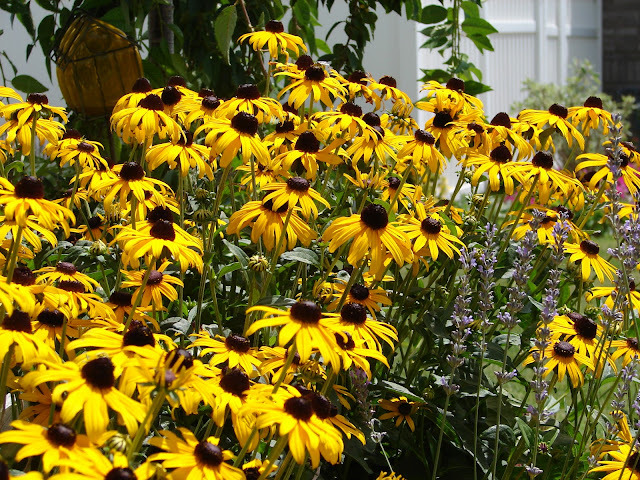 New Utah Gardener: Black Eyed Susan - Fabulous Late Summer Color! Black Eyed Susan - Fabulous Late Summer Color! There is a gorgeous perennial plant blooming all over our area and it loves the sun and the heat of August! It is Black Eyed Susan - Rudbeckia hirta. There are several varieties ranging in color from yellow/gold to orange to red/rust. Rudbeckia is an excellent choice for a waterwise garden with lots of hot afternoon sun. The more heat, the better! They need a good soaking once or twice a week during the hot times of summer. Keep it deadheaded and it will bloom all through the fall. It adds cheerful color when the other perennials are finished blooming. It looks great planted with other late-summer-blooming, heat-loving, drought-tolerant perennials like Sedum 'Autumn Joy' and Caryopteris clandonensis 'Dark Night'. It is hardy on the Wasatch Front so it will come back next year!